I started to lose weight several times in the last couple of years. I would get a decent start but I would always end up quitting. I finally came to the conclusion that I needed accountability. I decided to try a personal trainer. This was totally out of my comfort zone but Mark made me feel at ease from the start. I started out thinking I was just there to get help losing weight but Mark’s program is about a complete healthy lifestyle. From nutrition to fitness, he covers it all and covers it very well. He is very informative and explains the "why" behind everything he has me do. I also love the variety of exercises in my workouts. I had shoulder surgery a few years ago and was also diagnosed with fibromyalgia. Mark designs my workouts to prevent injury or re-injury. I trust Mark to know what kind of workout my body is capable of and he pushes me beyond where I thought I could go. I am getting stronger and losing weight as a result. My shoulder is stronger and better and my fibromyalgia pain has been greatly reduced. I was not expecting such a dramatic difference but I am feeling very good and more energetic. Mark is an excellent personal trainer. He creates a workout catered to the needs of the individual. He is very knowledgeable, enthusiastic, and professional. He always encourages me to do my very best. 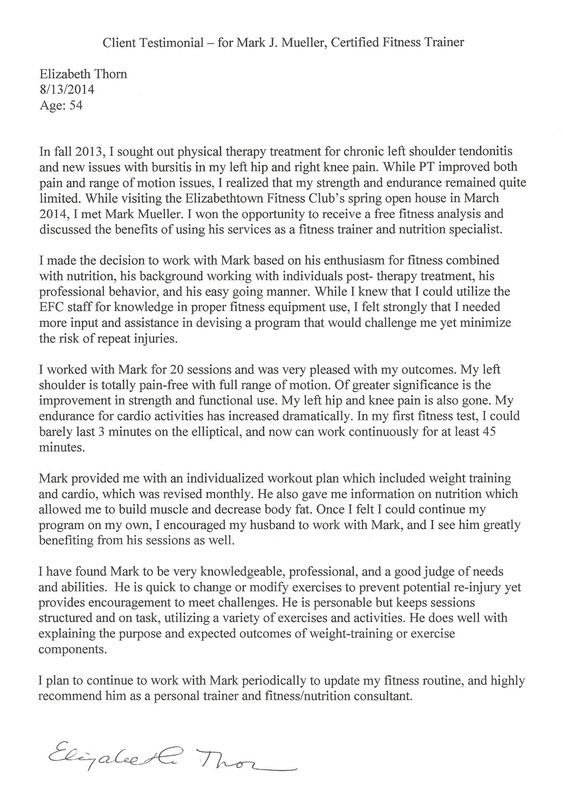 I would highly recommend Mark as a personal trainer and nutrition consultant. When I first met Mark, I had never set foot in a gym and was very anxious and intimidated by the whole experience. I had recently been diagnosed with low bone density and my doctor suggested that I run/walk and lift weights to help increase my bone mass. So after giving myself a pep talk, I called a local gym to get started. That's when I was lucky enough to be connected with Mark. We started out by sitting down and having a conversation about what I was looking to accomplish in my workouts. This was definitely not the approach I was expecting. Mark really listened to what I had to say and what my issues and concerns were. He then introduced me to the various pieces of equipment and gave a very thorough explanation of how they work and the muscle groups being targeted. Mark got me started on a program that addressed my "bone issues" and my desire to become stronger. Nine months later, I am in the best shape of my life. I am lifting weights, running and best of all feel healthy inside and out. I truly believe if it wasn't for Mark making this process as painless (well, my muscles may differ about that statement) as possible, I might not have stuck with my workouts. He continually pushes and challenges me in a way that makes me want to keep doing the same for myself. Thank You!! If you were to read my medical profile it would read something like this...50 year old female with diabetes, fibromyalgia, high cholesterol, obesity, plantar fasciitis and anxiety. Surgeries include both left and right rotator cuffs and a neck spinal fusion. Previously treated for a partially torn meniscus in the left knee and sciatica nerve inflammation. I finally realized that I needed to take control of my own health, so I joined a gym and signed up for their Healthy Lifestyles Program. My goal was to get my fibromyalgia pain under control, to reduce the amount of of prescription medication I was taking for diabetes, find an outlet for my stress and to lose weight. Mark was my "Wellness Coordinator". He designed a workout program that was tailored to acknowledge my past injuries and yet focusing on strengthening these weaker muscles and OHHHH he challenged me me to believe that I could succeed beyond any expectations I would have ever had for myself. I started personal training with Mark once a week and he pushed me to work hard and encouraged me every step of the way. We set short and long term goals and he assessed my progress regularly. I have had some ups and downs with physical injuries and life events but Mark takes interest in me as a whole person and he adjusts my workouts as needed to address my current situation. No matter what, Mark has always encouraged me to persevere through it and move forward. I have a success story to share...I began to see and feel amazing changes both physically and mentally. I have lost weight, my diabetes blood work shows great improvement and I have eliminated the need for several prescriptions. My fibromyalgia pain is under control and most importantly, I feel great! I am amazed at what I have accomplished in both my strength and endurance. I feel good about myself. I never thought I would say this but, I look forward to going to the gym and now I am starting to personal train with Mark twice a week. If you want to be motivated, challenged, encouraged and you want to live a healthier life then you want to train with Mark Mueller. It was a pleasure to work with mark as my personal trainer. I can say, without question, that his dedication and enthusiasm are second to none. Mark has the ability to bridge the gap between strength, conditioning and endurance to help you reach your goals. I would recommend Mark and his programs to help you achieve a fit and healthier lifestyle. You will be in excellent hands. I trained with Mark for a few months before sustaining an upper back injury from an incident at home. Because of my injury, I froze my gym membership to undergo physical therapy. Mark had been working with me on my goal of building muscle and sculpting. After two months of physical therapy, I have had to change my personal goals. While I was training with Mark, he developed several workout programs for me as well as giving me nutritional advice. Because of my intense, faithful workouts, Mark considered me an athlete and was consistent at monitoring my lean muscle and body fat percentages. I panic at the sight of high numbers on any scale. Mark kept reminding me to ignore the number on the scale and to rely on the numbers we were seeing for my fat percent. These numbers revealed that I was making progress by losing fat and adding lean muscle mass. He made me feel better about myself and gave me constant encouragement to keep trying. Mark was in tune with me knowing my strengths, weaknesses and fear of the scale. His, "come on - just one more" attitude made me want to try to do what he asked plus do possibly two or three more. There's no doubt that Mark truly cares for the people he is training. He wanted to see me succeed in improving my overall health, build the muscle I love and to hold me accountable for my nutrition. I am looking forward to training with him again soon! When I contacted Mark, I had been training for four months for an upcoming half marathon. The training was difficult and I wasn't progressing in my endurance at all. Mark sat down with me and reviewed what I had been doing which also included my diet. He was able to determine that one of my main stumbling blocks was my daily low caloric intake as well as not eating enough of specific food groups. Mark also set up a weekly training schedule that challenged and pushed me to exceed what I had been doing. His confidence in me helped me to have more confidence in myself. Long story short...six weeks later I successfully completed the half marathon and completed it in a better time than I had ever anticipated! I felt great after the race and even the days following. Thank you Mark, for your training assistance and support! Trainer's note: When Pat came to me, she had plateaued at the three mile mark due to exhaustion. She had been stuck at this point for several weeks. In just six short weeks, and because of her commitment, dedication and winning spirit, Pat was able to add another ten miles to her run. Congratulations, Pat! Since working with Mark, I have more flexibility in my joints, better balance, I am stronger and I am off all of my pain pills. Best of all, I took my belt in three notches! Thanks, to you, Mark, I am hooked on exercise! Trainer's note: Richard came to me with degenerative discs in his neck. He did not have much mobility and was always in pain. Now he is pain free and has vastly improved mobility. It was difficult for his wife to get him to agree to consult with me, but now, Richard is always in the gym! He is a diligent and hard worker. Mark Mueller is an excellent Fitness Trainer. He takes the time to get to know the people he is working with. As with me, I had a double knee replacement three years ago and Mark took time with me to discuss training and how to do the exercises correctly to strengthen my knees and legs yet to be safe and not over-stress them. Mark also pushed me because he is very experienced in knowing how hard each individual can work. He is very encouraging and very professional. I feel that this experience will help me for years to come. It was a very good experience.